With what little free time I allow myself, it’s been spent (as I’ve previously mentioned) restoring and maintaining my bicycle. It was a rusty and beaten looking machine when given to me, but it’s starting to shine really nicely. I’ve also learned more about the bike thanks to members of Bike Forums. Near as I can tell, I’m at minimum the third owner. 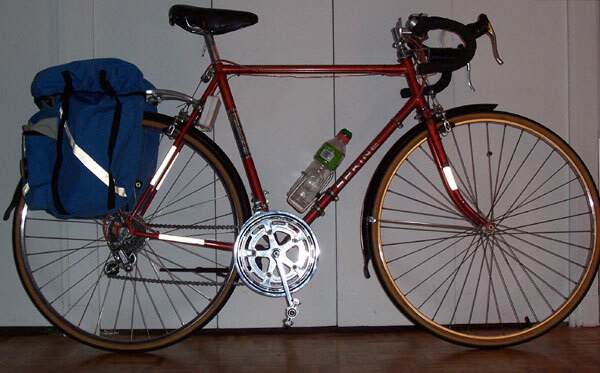 It was manufactured here in Canada in 1980 and was a low-end model for the manufacturer – Sekine. Sekine is a Japanese company that made bicycles in Canada for a period of time to avoid the import tariffs imposed by the Canadian government. 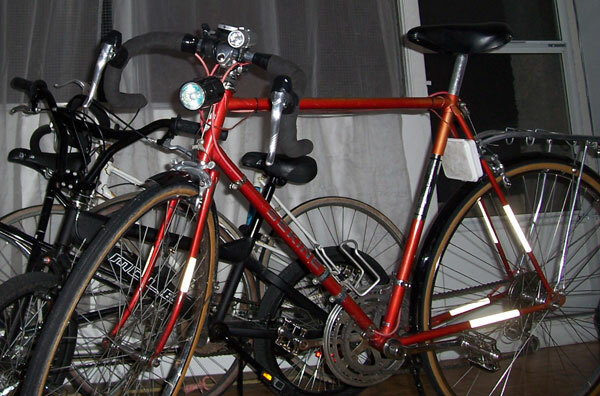 Local companies such as CCM and Raleigh Canada could not compete with the Asian bicycle prices during the bike boom of the ’70s and typical of our government, it imposed taxes to compensate. Since coming into my possession I’ve put a good deal of work into repairing this 26 year old cycle. Rust removal, and cleaning/lubricating the parts has been my main focus. 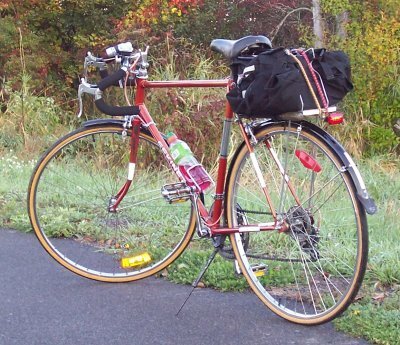 I’ve also added some extra gear since it had the mounting points – fenders, a rear rack, cycle-computer, LED headlamp, LED rear blinker, reflective tape and more recently panniers. Still in progress is a custom 20w halogen light system I’ve been building from spare parts and uniquely used plumbing materials. In the third picture above, you can see the 20w halogen MR16 light in it’s custom enclosure just below and in front of the handlebar stem. The white box seen near the rear brakes (hanging just in front of the seat stays at the back) is the enclosure for the electronics required to run such a light. I’m trying to make the battery holder myself, but will more than likely fail and end up buying a pair of quad-AA holders to fit inside. It’s not a rush, since I can’t afford the rechargable batteries I’ll be needing until next week. The first picture was taken at the beginning of October, on my way to work. For the past little while I’ve been commuting to work (about 42km round trip) on my bicycle – since I added the cycle-computer just before the beginning of the month I’ve gone over 500km. I just barely went over 521km this year, and I have a 6.2km commute round trip. One of my happiest places to be is out and about on my bicycle, and I use it for getting everywhere in Ottawa… And the kilometers add up really quickly when you factor in the 40km round trip.